Black and white action photo of bay colt, King Ben. 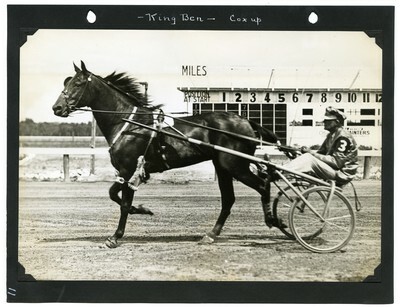 Ken Ben was driven by W. Cox to a first place win in the Calumet Farm Stake, Two-Year Olds Claiming Race — $3500 at the Grand Circuit Meet, Rockingham Park, Salem N.H., August 1, 1932. The race track scoreboard is seen in the background of the photo.